Pioneer forges ahead into the in-ear headphone market | What Hi-Fi? There are three new models in the latest line-up: SE-CL34 (£29.99); SE-CL521 (£29.99); SE-CL531 (£39.99). All three incorporate 9mm drivers with a frequency range of 10Hz to 22kHz. They also have a gold-plated 3.5mm stereo mini plug, and cords more than one metre long. The SE-CL34 is designed for the fashion conscious, says Pioneer, and comes in bright red, blue or white matt finishes. The SE-CL521 is for those who prefer a more classic design, and is available in white, red, dark blue or black with "excellent noise cancellation", according to Pioneer. At the top of the range, the SE-CL531 has a specially designed ear holder to keep them firmly in place. You can choose from red or black finishes. 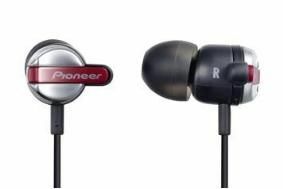 Earlier this year Pioneer unveiled its SE-CL23 and -24 designs aimed at "fashion and music lovers".